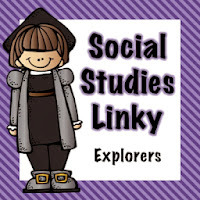 We just took our Native American test last week, so this week we're moving on to European explorers. With our new learning standards from the state of Ohio, we don't teach an entire unit on explorers anymore in fifth grade. Our "I Can's" really focus on the cultural impacts of explorers. For example, place names, foods, words in our language, etc. Much of the "history" has really been passed down to fourth grade. However, before we get into our regional studies and how explorers impacted various regions of the country - students do need reminding that Europeans came to America. So, we're spending this week doing a brief overview of explorers. We're going to read Encounter by Jane Yolen and watch the National Geographic documentary America Before Columbus. For Encounter I share optical illusions and discuss how history often has two sides. We look at how if we look at history from different points of view we can see different things. The students love this connection and the book, too! Then, over the next two days students watch the documentary America Before Columbus in two parts. They look at life for Native Americans before European explorers and after European explorers. Students complete a handout as they watch the video to get down some key ideas.Our public library has a free copy to check out but Amazon and National Geographic both have copies for sale. ** The total documentary is 90 minutes in length and would be appropriate for 5th graders and up. There is a part about some of the disease that were spread but it does not go into graphic detail but it does mention some of the diseases that were spread in brothels. It has been on the National Geographic channel. You can fast forward or just choose to "not explain" that scene. It's less than 20 seconds and goes into no detail with students. As always, watch the video first and make sure it's suitable for your group of kiddos! We're ending the week with some cultural stations. Students will be looking at language, food, places, and architecture influenced by Spanish, French, and English explorers. I'll post a separate link up about our stations after we complete them this Friday! I'm linking up with Diane from Fifth in the Middle's Explorer Linky Party! Can't wait to see some other great explorer activities! Hope everyone has a wonderful October week! Encounter is such a great book! I love how you are using optical illusions to illustrate that there are two different sides or perspectives in regards to history. Your kids are SO lucky to have such a wonderful teacher! Love the optical illusion part. Will have to add this when we do Encounter! Thanks again for linking up!